This one bedroom apartment is situated near the corner of Elizabeth St and A'beckett St. It features a spacious open planned living and dining area, bedroom with a queen size bed, european laundry with washer/dryer along with a modern fully equipped kitchen fitted with a dishwasher, gas stovetop, oven and stone bench. The spacious open planned living area offers all you will need for in-house entertainment with a Smart TV offering access to Netflix and youtube along with unlimited wifi. 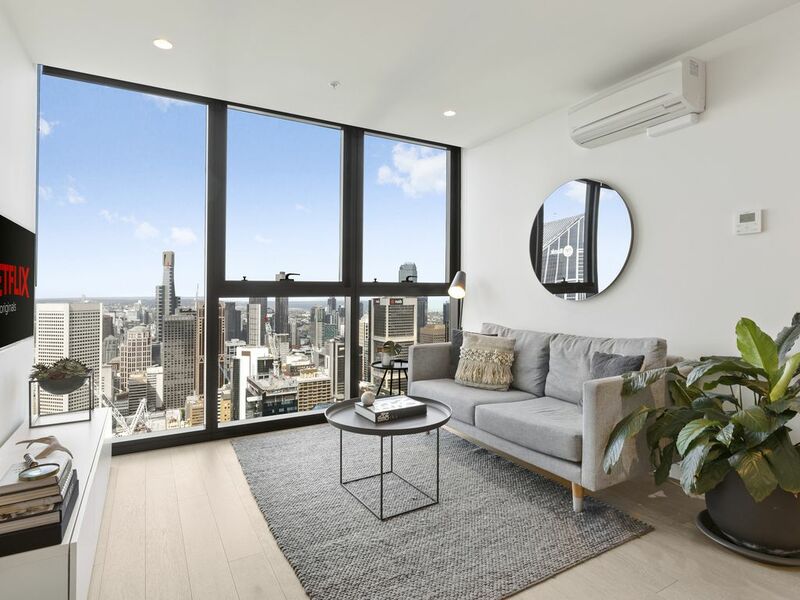 This apartment is located on the 55th floor of the EQ Tower and offers expansive views of the city skyline, capturing the character and charm of the Melbourne CBD and surrounding suburbs. As a guest you will have access to the EQ Towers 5-star facilities including the gym, pool, spa and sauna. Located in the heart of Melbourne CBD, this apartment is just minutes walk away from almost everything. Secure car park is available for an extra $15 per night. Parking is limited so please contact us prior to making a booking to ensure a space is available. As a guest you will have access to the entire apartment with linen, towels, hairdryer, ironing facilities, washing machine and dryer all included. Bathroom amenities provided include Shampoo, Conditioner, Body Wash and Toothpaste. Kitchen cooking essentials provided include Milk, Tea, Coffee, Sugar, Oil and Salt & Pepper. While we will try our best to accommodate early check-in and late check-out's, we cannot guarantee your requests. Please inquire before booking. Please Note: If we are not able to accommodate your early or late check in/out request there are luggage lockers at Southern Cross Station that can store your belongings for 24 hours. We have teamed up with a premium chauffeur service to offer first class transport from the airport to your accomodation. Prices for this service will vary depending on the location and number of people travelling. Please inquire before or after booking. For groups with young children, please note that this apartment is not fitted with any child safety guards - you are welcome to book if you accept this and full responsibility of your child(ren). Please Note: Upon request we can provide a travel cot and/or high chair for an additional fee. This price will vary depending on the length of stay. Please inquire before or after booking. Welcome to Luxuria Property Group! Luxuria Property Group provides designer short-term accommodation around Melbourne. All Luxuria properties are fully equipped with 5-star linens, towels, toiletries, complimentary Wi-Fi and all the essential items that you will require during your stay. Live like a local in a little bit of luxury with the help of a Local Information Book, unique to each property to provide you with the insiders guide to the best local haunts for great coffee, food, wine, shopping and activities. Let us make your next trip to Melbourne a perfect one! Our recent stay at the Luxuria Apartment was exactly what we had hoped for. The apartment was clean, convenient, and comfortable. The gym had up-to-date equipment and was spotless. We didn't use the outdoor pool, but it was clearly a bonus. Plus, the views were spectacular. We would definitely stay here again! Great apartment and view. Well equipped with many extras. We would gladly stay again. Check in quick and everything was well explained. Great facilities in the building. Walk to the mall and vic markets. Wifi Netflix and all the comforts of home .